The energy supply is in a state of transition. Electricity generated by solar and wind energy in particular will increasingly replace the large-scale fossil production. Moreover, electricity will constitute a greater share of the energy mix. The further integration of gas, heat and electricity will make it possible for sources to be interchanged. The ECN System Integration R&D programme will contribute to this. Why is system integration necessary? Due to the significant increase in sustainable energy in Europe, established for the Netherlands in the Energy Agreement, the demand for flexibility in the electricity system is growing rapidly. The limits of the current flexibility will be reached around 2020 and even earlier at the local level. That is why the development of solutions must start now already, taking into account the prospects after 2030. The integration of energy systems is part of these solutions. What is the role of sustainable energy? Due to the policy of significantly reducing CO2 emissions, the use of sustainable electricity for heating, transport and raw materials will increase. The Storage & Integration of Renewable Energy R&D programme is working on the integration of this sustainable energy. This work is carried out from an integral perspective on energy generation, use and infrastructure. The partners are from various sectors, such as Electricity, Gas, the processing industry and ICT. What is the advantage of system integration? There are opportunities at the intersection of offshore wind energy and industrial harbour complexes in the countries surrounding the North Sea. These opportunities include making the processing industry and data centres sustainable. System integration allows infrastructure and the energy generation capacity to be used efficiently. This will ensure that the sustainable energy system of the future will be reliable and affordable. The scale and sequence of the energy transition determine which solutions are necessary for the integration of sustainable energy. ECN provides insight into the development of markets and prices, as well as the potential and market opportunities of technologies. An energy system in which flexibility is more important requires new market models, policy instruments and behaviour analyses. ECN develops knowledge and insights, and provides the quantification. 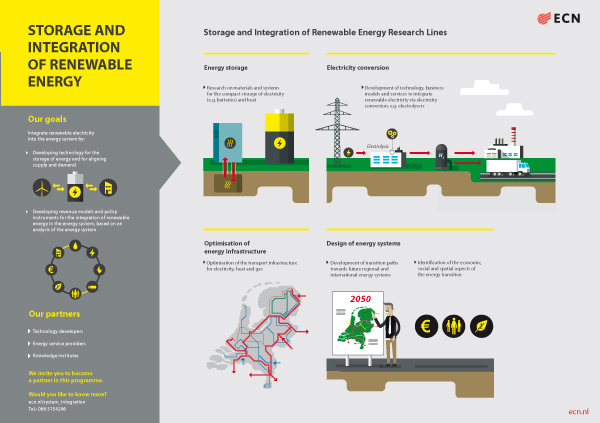 Energy storage is relevant at the local level in combination with solar and wind energy, as well as at the system level. ECN is working on battery systems, kinetic energy storage and conversion of electricity into heat, gas or chemicals. The processing industry is a major consumer of energy and raw materials, and can use a great deal of sustainable electricity. ECN is working on process and system analyses, demand response and conversion technology. If you would like to know more about the system integration possibilities for your company, please contact us.